Taiwan has unveiled what it says is the world's tallest building - a 101-storey structure which hosts offices, a mall and an observatory. Taipei 101 drew crowds when its first phase, the five-storey shopping mall, was opened on Friday. Managers of the block, which reaches a height of 508 metres and cost $1.7bn to build, aim to rent at least half the office space by the end of the year. It overtakes Kuala Lumpur's 452-metre Petronas towers, previously regarded as the world's tallest building. Officials say the office tower and observation deck will be opened next year. The building was opened by Taiwan's President Chen Shui-bian, who said it would help push Taiwan onto the world stage. 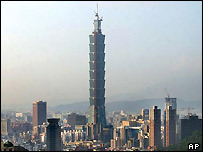 There has been some dispute over whether Taipei 101 is yet the world's tallest. Last month, the Council on Tall Buildings and Urban Habitats said that the Taiwanese building has not yet met all the criteria to be considered the tallest. Its chairman, Ron Klemencic, said that a candidate building first had to be occupied and in use. Some Taipei resident expressed fears earthquakes could threaten the city's latest engineering feat. But developers say the closest fault line, 198 metres from Taipei 101, has not been activated for 45,000 years. The building, financed by the Taipei Financial Center Corp, which includes the China Development Industrial Bank and Cathay Life Insurance Co., is expected to be fully completed by the end of 2004. However, it may not be the world's tallest building for long. Chinese developers say the Shanghai World Financial Centre will be taller when it is completed in 2007. There is much debate over the world's tallest structures. The CN Tower in Toronto is generally considered the world's tallest freestanding structure on land at 553 metres. To be considered as a building, a structure needs to be permanently occupied.